WHEN Greig McArthur gets in his Ferrari 360 Modena, he likes to take his iPhone along. He might have to call someone, of course, but it’s certain he’ll use the phone to see how his car is running. Mr. McArthur, a programmer who lives in Scotland and works there and in New York, likes to use the Dynolicious application on his phone to test the acceleration of his car and, for that matter, anything he happens to be riding in. He says his Ferrari went from 0 to 60 miles an hour in 5.2 seconds and the Q train in Queens reached a maximum speed of 42.4 m.p.h when he rode it about a month ago. Software like Dynolicious is now appearing as programmers begin to appreciate just what can be done with an iPhone and other advanced cellphones that know where they are and just how quickly they are going someplace else. Dynolicious tracks the changes of speed with the iPhone’s built-in accelerometer, a silicon-based sensor that measures the motion of a vehicle. The software constantly measures these changes and converts the information into a good estimate of how fast the car is going. Another program, called G-Tac, does much the same thing as Dynolicious. Both G-Tac and Dynolicious also work with iPod Touch models. But many car lovers question the accuracy of the information provided by such software, because the measurements are so small and because any errors can be compounded as the processor adds them up hundreds of times per second. This led Mr. McArthur to buy a special bracket that holds his iPhone horizontally because, he said, his wife’s patience for being told to “hold it correctly” was wearing thin. The iPhone is not the only place to find these sensors. Nokia includes an accelerometer in some of its more expensive phones, including the N95. Andreas Jakl, a professor at Upper Austria University of Applied Sciences in Hagensburg, Austria, has been encouraging his students to develop applications using the Nokia chips. One project, CarMeter, offers a more rudimentary measure of a car’s movement. Another, called gBoarder, uses many of the same ideas to let a snowboarder time a run and measure the longest jump. 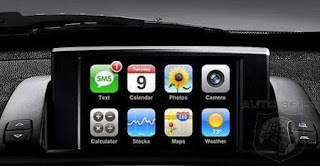 Other developers are pushing to build deeper connections between the iPhone and the car. Rev, a package from Devtoaster, promises to track and graph data like fuel consumption, intake manifold pressure and coolant temperature. It will get this information through a wireless connection to the OBD-II socket, a standard interface that is often used by mechanics to tap into the car’s onboard computer and diagnose engine or electrical problems. The application is not ready for sale, but the company offered a free version, Rev Lite, that doesn’t require an OBD-II connection to measure acceleration. Karl Becker, a systems engineer in Cedar Rapids, Iowa, developed Car Care to handle his own needs. The iPhone application calculates a car’s gas mileage if you enter the odometer readings every time you fill up the car. If you want this converted into a measurement of CO2 added to the atmosphere, the software is happy to figure it out. The package will also track required maintenance and remind you when you need to check the oil. Other developers hope to harness the collective input of iPhone users everywhere. The free GasBag application collates reports about local gas prices to help users find the cheapest fuel near them. Mick Johnson, one of the programmers who created GasBag, said that the application already had 70,000 users, including one intrepid motorist who types in the prices of every station each morning along a commute on Interstate 5 in Southern California, from Mission Viejo to Los Angeles. Mr. Johnson said that his software was free because he was working to build a community. Revenue will come from ads.